A shake with PWA keeps your customer engaged. And PWA is always ready to become your best friend, then why are we not sending a friend request to PWA? It’s time to make a good step towards the PWA and I’ll explain how your friendship is beneficiary for you with PWA! For some reasons, many people think that PWAs are Single Page Applications (SPA). This is wrong, really very wrong (with status code 400 😄). A SPA can be a PWA, but a PWA does not have to be a SPA. Website built on any framework or library like ReactJs, Angular, VueJS or even in HTML can be a PWA. In the simplest terms, a Progressive Web App is a mobile website transformed with additional features and functionalities that give it an ‘app-like’ feel. It works using an instance of Browser and uses service worker to ensure smooth operation even without a reliable internet connection. If you have a myth that PWA is a Google technology then these pieces of information are enough to clear your myth. Progressive Web Apps are based on web standards. It works with every browser and every platform. So it’s a website — but it feels like a native mobile app, with a splash screen, custom loading screen, smoother animations, push notifications, and no navigation bar. Your average end users can call it a mobile app. Pinning to a home screen — We can add our web app icon on a home screen. Push Notifications — We can integrate push notification like in a native app via Push API and Notification API for the web. Offline Work Mode — Because of Service worker who manages caching mechanism, we’ll get rich user experience even if there is no internet. Accessing Media Features — We can access Microphone, Video and Camera Devices. Also, implement video and audio calling functionality using WebRTC API. Overall, you do not need to develop a separate mobile app for the same project if your requirements are fulfilled with PWA’s features. It means PWA are still struggling to provide some native app’s features. Yeah, that’s a wow moment for web developers. Other helpful features are already on its way. PWA is already looking forward to providing native app like features. Let’s take a look at those features which will really be helpful to us. Bluetooth — Web Bluetooth API is under development and we will soon access Bluetooth on the web platform. Sensors — Sensors are a really important part of today’s development era.Some sensor’s access is already in development like ambient light sensor, proximity sensor, accelerometer sensor, magnetometer sensor, and a gyroscope sensor. Native Sharing — We can invoke the native sharing mechanism of the device as part of the Web Share API. Fingerprint Sensor — We can authenticate users via the fingerprint sensor using Web Authentication API. But is it still under development due to security reasons. Why everyone adopts PWA nowadays? After reading some statistics of big companies who adopt the PWA, you’ll know the power of PWA and clearly understand why everyone wants to go for PWA. Twitter developed Twitter Lite Progressive Web App in April 2017 and in the result twitter increase pages per session by 65%, Tweets sent increase by 75% & bounce rate decrease by 20%. Flipkart, India’s largest e-commerce site decided to shut down the app-only strategy in 2015. After that, they came with Flipkart Lite which is Powered by PWA and you’ll be amazed by reading It’s great results. Users spent more time on site at the rate of 3x, Re-engagement rates are 40% higher, 70% greater conversion rate among those arriving via Add to Home screen, and 3x lower data usage compared to the native app. Alibaba.com, The world’s largest online B2B trading platform. Alibaba.com came with a new strategy as PWA to deliver a great user experience for both first-time visitors and repeat visitors. Their new strategy came with surprising results. Alibaba.com got 76% higher conversion rates across browsers, got 4% more monthly active users on iOS & 30% on Android, and 4x higher interaction rate from Add to Home screen. Yes, that is unbelievable and we have to accept the beauty of the Progressive Web App. Now you understand, why I’m forcing you to make PWA your best friend. Yes yes yes! Play Store and PWAs have now become friends. Now we can publish PWAs on play store with the help of Trusted Web Activities (TWA). Google Chrome 72 added Trusted Web Activities to support full-screen web view without displaying URL or any browser related elements. So you can generate an APK of your web app and upload it to play store with the help of Android studio and some knowledge of Android development. The existence of PWAs like Facebook Lite, Instagram Lite, Flipkart Lite, and Twitter Lite are mostly using WebView and gives us app-like feel. But keep in mind that Apple still doesn’t give support to TWA. 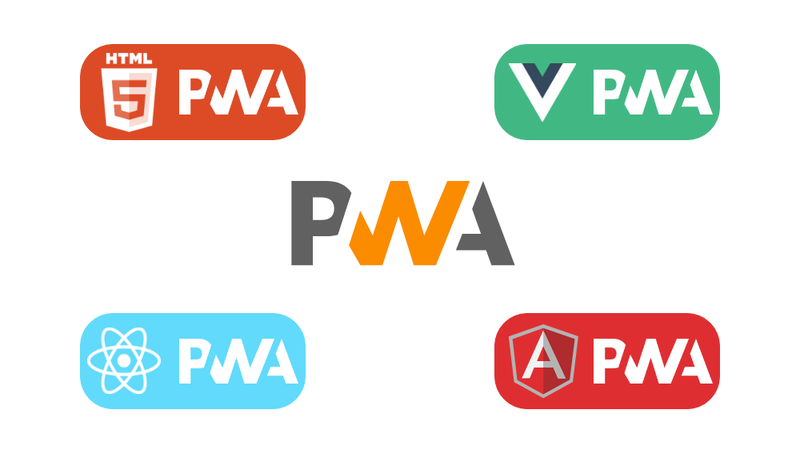 In the end, we can say that PWA is a good and cost-effective approach to develop our web apps. It is surely a future of web development. We hope PWA serves us more in the future as always. Yudiz refers to the spirit of youth. In coherence with the spirit of innovation and creative spurt that is so natural to youth we at Yudiz believe in thinking beyond the convention to shape multitude of web aspirations.